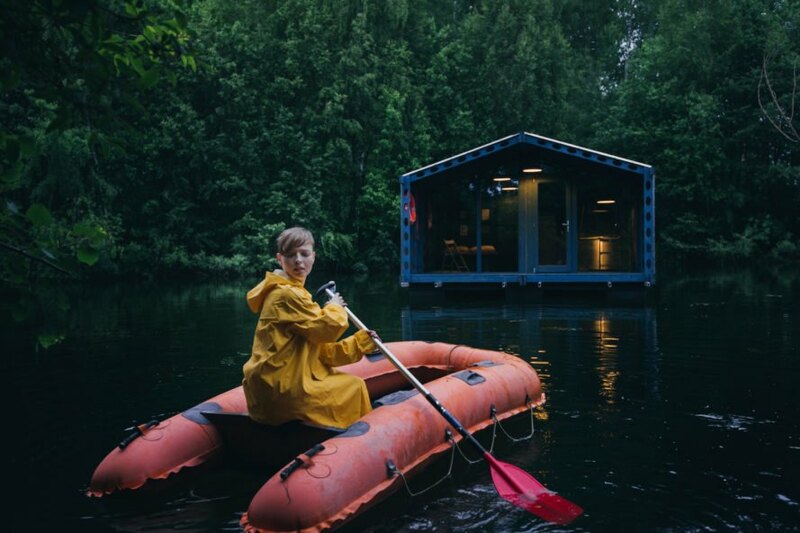 Russian firm BIO-architects recently unveiled their latest modern modular cabin — and it floats on water. 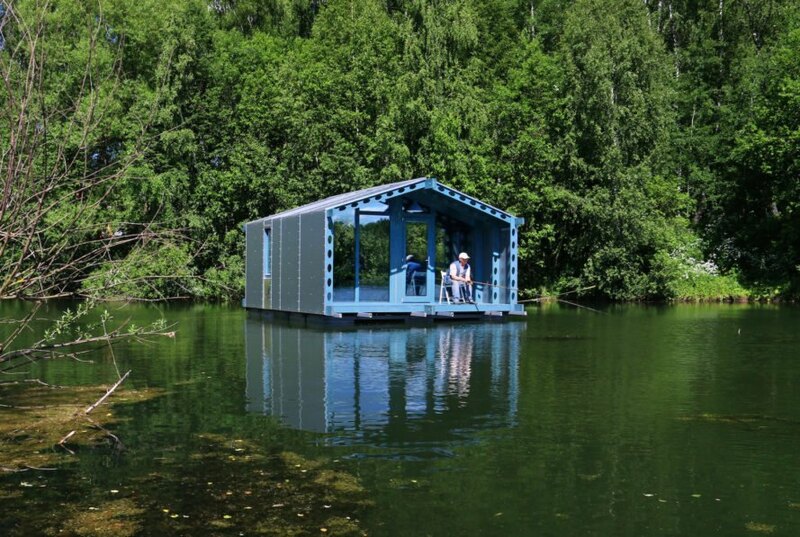 The DD16 house was prefabricated off-site and then dropped on a lake near Moscow. 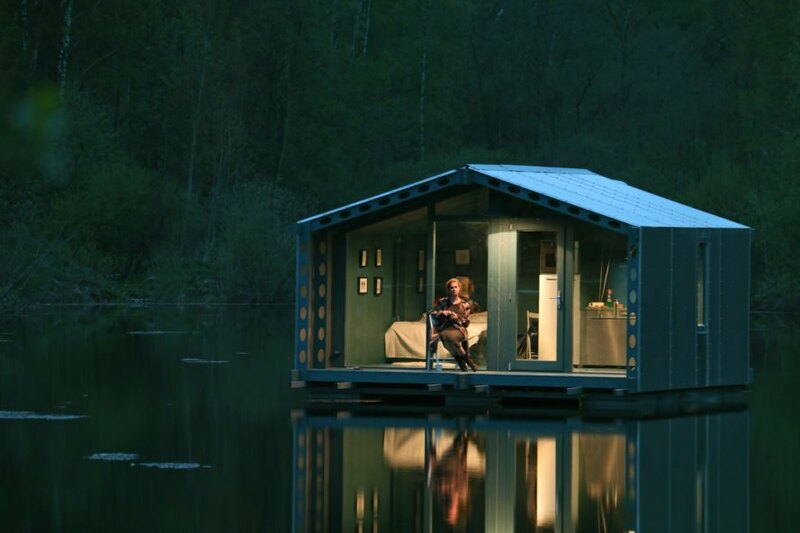 Designed for remote locations, the off-grid cabin is lightweight enough to float and durable enough to withstand harsh winter extremes It also harvests solar energy for electricity, draws fresh water from the lake, and uses a composting toilet for waste. The milled ports help reduce the structure’s weight and minimize cold bridges and gaps. Lightweight polyurethane foam is used for insulation, while the facade is clad in lightweight composite aluminum sheets for a seamless finish from top to bottom. 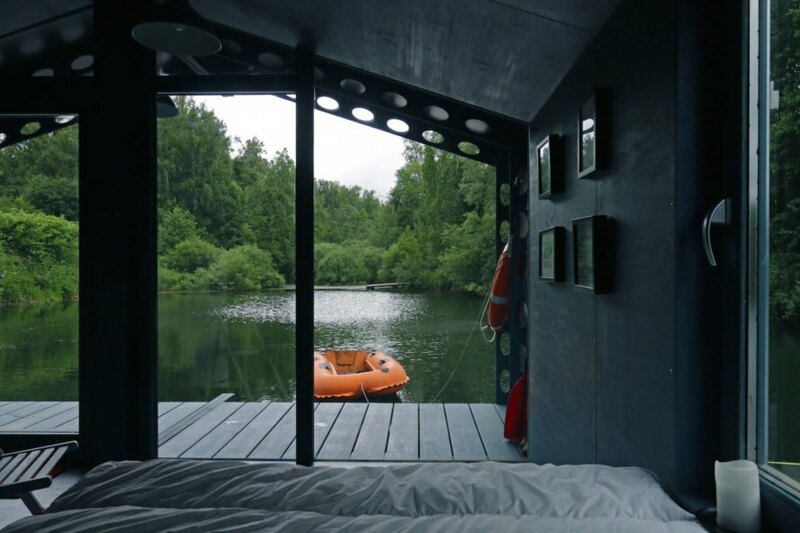 The cabin was also constructed with modular pontoons that are used to support the floating structure and can be disassembled and stored inside the cabin during transport. DD16 can be easily put in place with a crane or helicopter thanks to beam releases that make it easy for just one person to do the rigging work. The customizable interior features a double bed, bathroom with shower, dining table, and living room where a wood-burning stove can be installed. Despite the compact size, the cabin feels surprisingly spacious thanks to the glazed end wall that lets in a great amount of natural light and blurs the distinction between indoor and outdoor living. Hidden storage and transforming furniture also help reduce visual clutter. The DD16 prototype is currently being rented out to clients seeking a unique retreat in wilderness. The team plans to test the house is different extreme conditions. 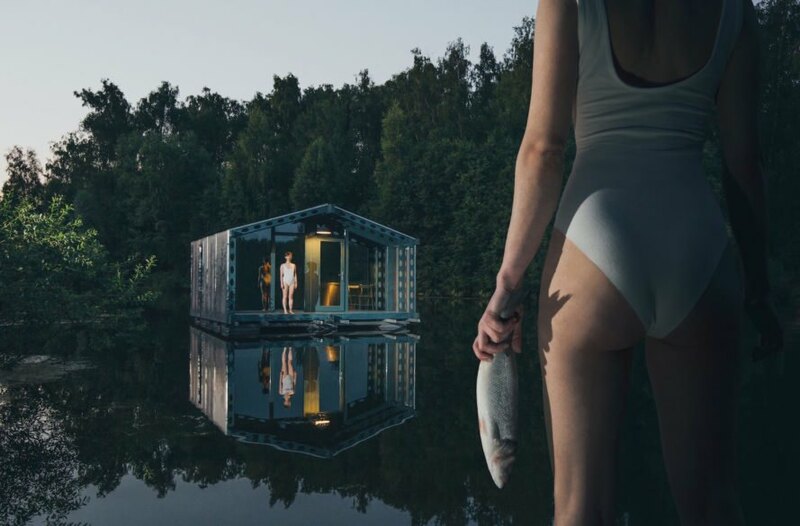 Russian firm BIO-architects recently unveiled their latest modern modular cabin—and this one floats on water. 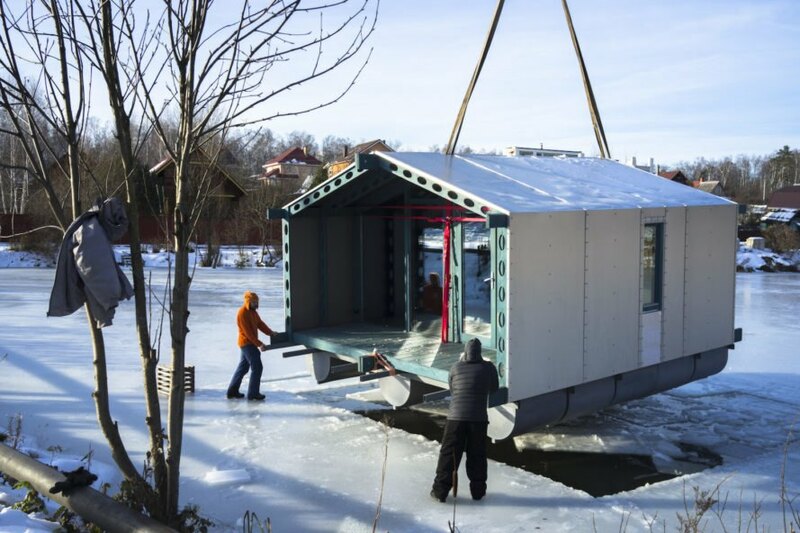 Prefabricated offsite, the DD16 house was dropped on a lake near Moscow and is lightweight and durable enough to float and withstand harsh winter extremes. 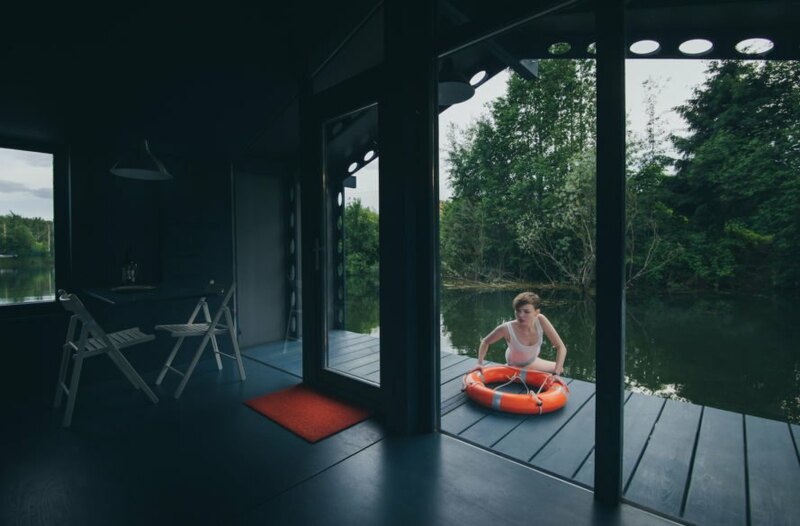 Designed for remote locations, the off-grid cabin uses solar energy for electricity, draws fresh water from the lake, and uses a composting toilet for waste. The 16-square-meter DD16 cabin is a prototype that is being tested through rentals under the DublDomClub organization. The house comprises two modules prefabricated at a factory and constructed with a laminated timber frame with milled ports. The milled ports help reduce the structure’s weight and minimize cold bridges and gaps. Lightweight polyurethane foam is used for insulation, while the facade is clad in lightweight composite aluminum sheets for a seamless finish from top to bottom. The cabin was also constructed with modular pontoons that are used to support the floating structure and can be disassembled and stored inside the cabin during transport. DD16 can be easily put in place with a crane or helicopter thanks to beam releases that make it easy for just one person to do the rigging work. 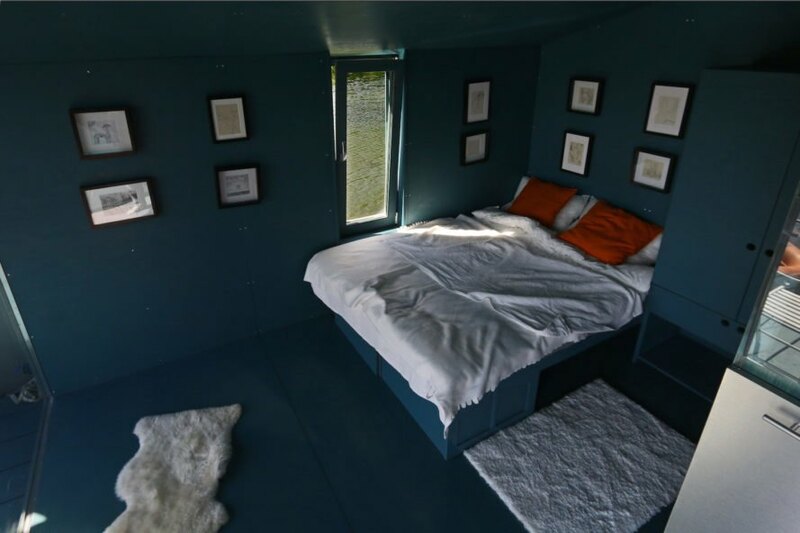 The customizable interior features a double bed, bathroom with shower, dining table, and living room where a wood-burning stove can be installed. Despite the compact size, the cabin feels surprisingly spacious thanks to the glazed end wall that lets in a great amount of natural light and blurs the distinction between indoor and outdoor living. Hidden storage and transforming furniture also help reduce visual clutter. The DD16 prototype is currently being rented out to clients seeking a unique retreat in wilderness. The team plans to test the house is different extreme conditions.